Birthday Party Ideas for kids by age / how many years old they will be on their birthday. 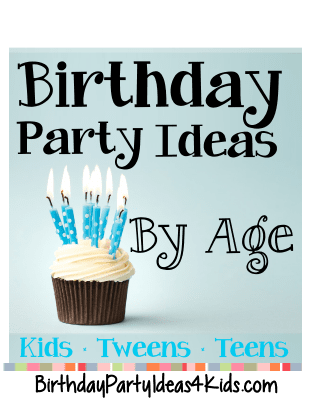 Choose the age that they will be on their birthday and find great ideas for birthday party themes, party games, birthday activities, party planning timelines, how to get adult guests to help with the party, RSVP help and how to get a response from the party invitation and more that are all age appropriate. Click the number that corresponds to the age of the birthday child and find great ideas! 1st birthday party ideas and games - how to make the first birthday extra special for all the guests. Keepsake time capsule instructions. 2nd birthday party games, activities and more! 3rd birthday party timeline, games, themes and everything you need to plan the perfect third birthday party. 4th birthday games, ideas and fun things to do at a fourth birthday. 5th birthday party ideas for boys and girls who are turning five years old. 6th and 7th ideas for six and seven year old parties. 8th, 9th, 10th, 11th and 12th tween or preteen party ideas. 13th, 14th, 15, 16th, 17th and 18th birthday parties for teenagers. Special pages for Sweet sixteen parties! Let's get the party started with over 200 birthday party themes, party games for all ages, scavenger hunts, treasure hunts, and great ideas for decorations, invitations, party food, favors and goody bags!